Describe the methodology used to limit or manage risks to facilities. Discuss at least three major criminal/terrorist threats to facilities. Define the typical severity and product resistance levels for these threats, with a focus on fenestration systems. Examine combined threat resistance and the challenges of designing to this criteria. As security threats continue to escalate around the world, demand for greater threat resistance in buildings increases at the same rapid rate. What formerly was a priority mainly in diplomatic and military facilities now extends not just to high-risk facilities, but to critical infrastructure like data centers, power generation plants, oil and gas centers and equipment, chemical manufacturing and transport, and centers of water supply and mass transit. Many other organizations, both public and private, are also seeking to incorporate higher levels of building protection into their physical security plans for commercial, financial, and educational centers. Since the 1995 bombing of the Alfred P. Murrah Federal Office Building in Oklahoma City, and even more intensively after the terrorist attacks of 2001, the safety of buildings and their occupants has become a concern in virtually every building type. 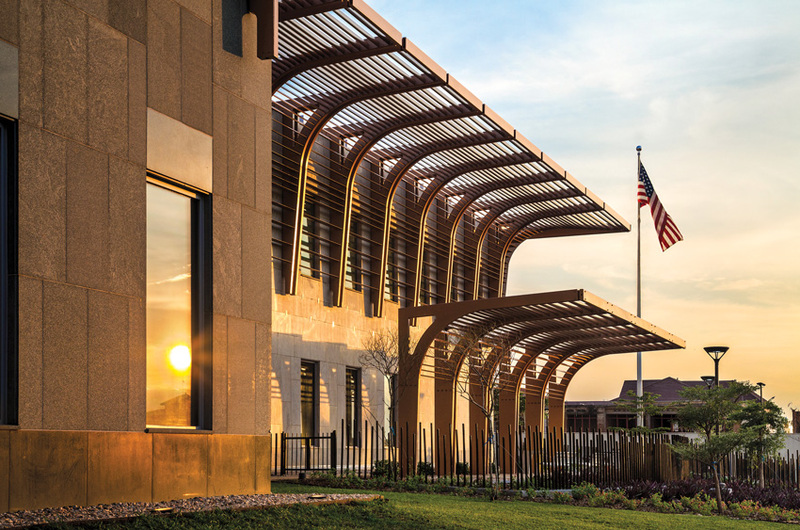 High-level physical security standards as well as innovative, sustainable design are built into the U.S. Embassy in Bujumbura, Burundi. Fenestration in buildings—glazing, windows, doors, louvers, hatches, and other components—can be a key vulnerability, and thus it is an essential element of design for threat resistance. This course focuses on methods of understanding and responding to today’s most urgent physical threats: explosive blasts, ballistics, and forced entry. The information here can guide professionals in asking the right questions about fenestration products and design, and can help define levels of protection for people and property so that the products can become a positive part of the architectural design and overall function of the building. Products are now available that can provide effective protection for a wide range of security threats. They are used on high-risk facilities that require the highest levels of protection throughout the building and its site, and buildings that may be better served by more limited measures, such as designated safe rooms, hardened main entrances, and fortified control rooms. Often a measure that may be prohibitively expensive to use on an entire large commercial building can be effectively deployed to protect certain defined areas. Through extensive testing, development of standards, and often harsh experience in buildings all over the world, the principles of designing for high-level threat resistance have evolved rapidly. A range of tested approaches and innovative products are available to provide solutions for architects, engineers, and security consultants as they design buildings to meet complex requirements with literally life or death consequences. 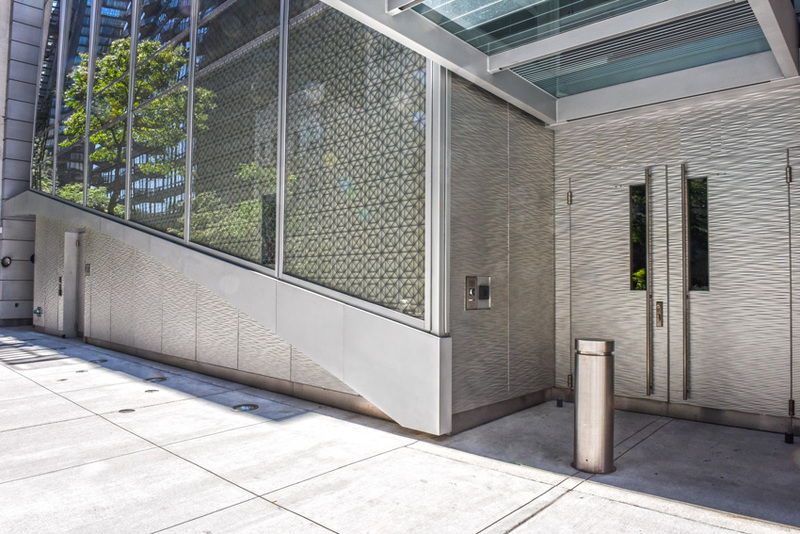 While specialized fenestration products used throughout many high-risk buildings may be prohibitively expensive for lower-risk applications, they can be effectively deployed to protect critical or vulnerable areas, such as safe rooms, command centers, and exterior entrances, as shown here. Serious and often tragic attacks on American facilities have filled the news in recent years, not only involving diplomatic or military facilities but also civilian locations where heavy fortification was never a factor in the building’s original design. These events have turned urgent focus on the need for better ways to protect people, buildings, and assets from disasters caused by human aggressors. The Risk Management Process for Federal Facilities: An Interagency Security Committee (ISC) Standard, implemented in nonmilitary federal U.S. facilities. The Unified Facilities Criteria (UFC) Department of Defense Minimum Antiterrorism Standards for Buildings, developed for DOD facilities. The Department of State (DoS) Overseas Building Organization (OBO) Design Standards, developed for DoS properties. Since the magnitude of the threat to DoS buildings overseas is generally greater than in domestic facilities, the performance criteria are consequently more arduous. Products that meet DoS requirements are designed and tested to provide effective protection against specific threats according to these stringent criteria. Identify and prioritize the assets to be protected: This includes detailed analysis of occupants, equipment, and the functionality of the building itself, with primary, secondary, and any necessary additional relative rankings; for example, the key operations in a pharmaceutical or chemical manufacturing facility, the emergency priorities in a telecommunication center, or sensitive documents or devices in a diplomatic facility. Determine asset value: This involves specific questions about the relative value of materials or areas in the facility: Which is most critical in an emergency? Which is the most vulnerable? How replaceable are the building contents? Is its value in its geographical location or prominence as a landmark or high-traffic area rather than its contents? What is the impact of a loss? For example, if the facility being assessed is an air-traffic control tower, a downtime of a few minutes may be a serious impact of loss, while in a social security office, a downtime of a few minutes would be minor. But it is also important to recognize that the consequences of an attack would likely extend beyond the building itself to the wider community, with potentially serious impacts; for example, if an explosive device were detonated in a chemical plant, or an attack on a data center disrupted service, or an electrical substation were put out of action. Determine the nature and likelihood of aggression: Based on the asset profile, what is its relative usefulness to potential aggressors? How accessible is the site or the building to these potential threats? Develop design criteria for threat resistance: This is the focus of this course. Answers to the fundamental questions above will guide decisions about what is required from the design of the system and the products involved. 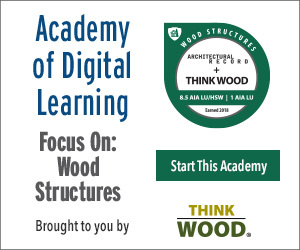 Standards and testing have evolved to help provide a precise framework. Obviously not every threat can be anticipated, and buildings can’t be designed to resist every threat at the highest possible level of security (although certainly there are facilities in the world engineered to the highest standards possible with current knowledge and materials). To design effective measures for resistance—in this case, protective fenestration systems—it is necessary to define precisely the nature of the threat, the severity of the threat, and the level of protection that the system or product will provide, as outlined in the following section. The earlier in the planning process that this analysis can be done, the more cost effectively the threat resistance measures can be integrated into the building’s overall design, construction, and mission. Many of the same specialized fenestration products used around the world in facilities requiring the highest levels of protection can also be used effectively in almost any building type to protect against a wide range of security threats. 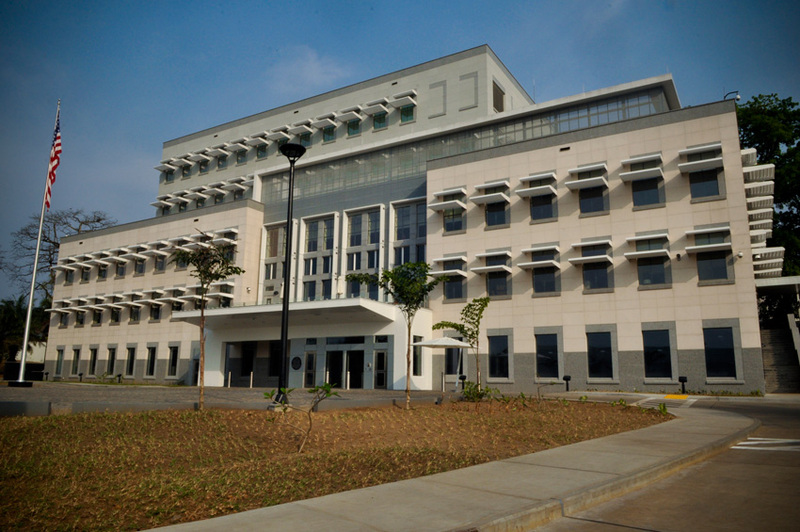 Shown here is the U.S. Embassy in Monrovia, Liberia.